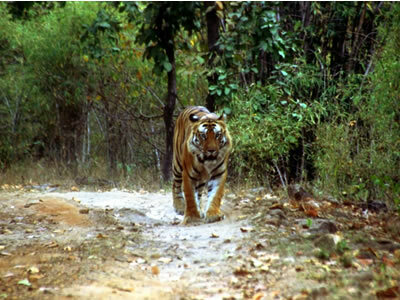 Rajaji Tiger Reserve is an interesting animal habitat because of its location at the meeting point of the lesser Himalayan foothills and the beginning of the vast Indo-Gangetic plains. The park has a large population of elephants and leopards. 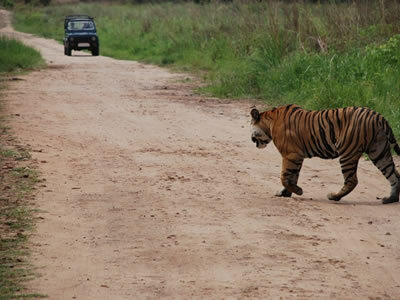 The Park is the north- western limit of distribution of Bengal Tigers and Asian Elephants in India. 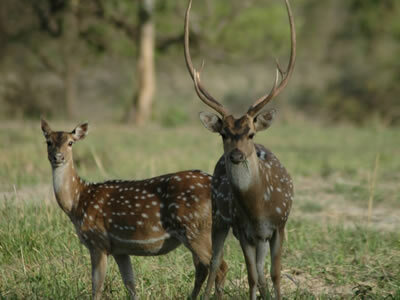 Among the herbivores, the Chital or Spotted Deer (Cervus axis) is the most common species, occurring widely throughout the flatter terrain of the Park. The Barking Deer (Muntiacus muntjak) is common in forest areas with ample ground cover. 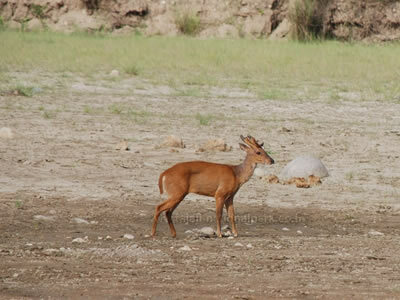 The Sambar (Rucervus unicolor) is widespread in the Park, especially in the more densely forested areas and on the gentler slopes of the Shivalik Hills. As pre a study done by wll, the density of Sambhar in India is highest in the Park at 25 per sq.km. 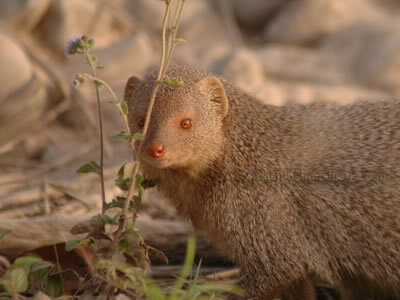 The Goral (Nemorhaedus goral) is found in considerable numbers in the Park, occupying a specialized niche in the relative bare rocky slopes at the top of the Shivalik ridges and hills. The Wild Pig (Sus scrofa) is fairly common in the Park, and it frequently raids the cultivated crops in fields on the park boundry. 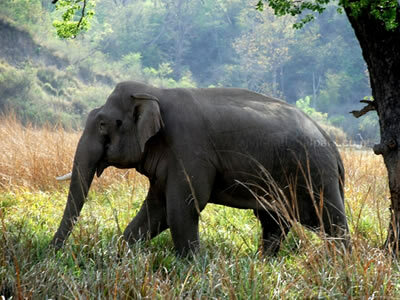 The Asian Elephant (Elephant maximum) is the most important wild animal in Park, and its numbers in the area have shown a steady increase over past 20 years. 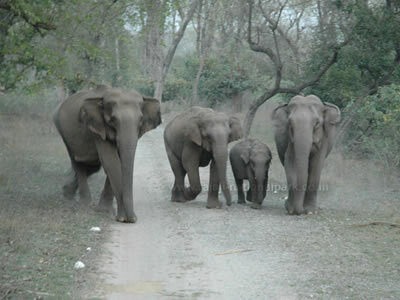 The Elephant population of the Park formerly used to vary with seasonal migration of considerable numbers across the Ganges in both directions, but the construction of the Chilla power channel in the mid-1970s put a stop to these migrations and effectively divided the population into two independent units. Amongst the major carnivores in the Park, the Bengal Tiger (Panthera tigris tigris) and Leopard/Panther (P.pardus) take pride of place. The lesser carnivores are represented by the Jungle Cat (Felis chaus), Leopard Cat (Felis bengalensis) and Small Indian Civet (Viverricula indica). For the first time ever, a Rusty-spotted Cat (Prionailurus rubiginosus) was recently camera-trapped on a hill road near the Shivalik Ridge. According to scientists from WII, this is a new record for north India. A proper survey needs to be done to assess the population and distribution of this elusive cat. The field's staff feel that there has been a drastic decline in the Jackal (Canis aureus) population in and around the Park, and sightings has become rarer over the years. The Himalayan Yellow-throated Marten (Martes flavigula) is a member of the check on the population of smaller rodents, birds, and even Chital by preying on their fawns. Both Sloth Bear (Melursus ursinus) and Asiatic Black Bear (Ursusthibetanus) occur in the Park, but sightings are rare. 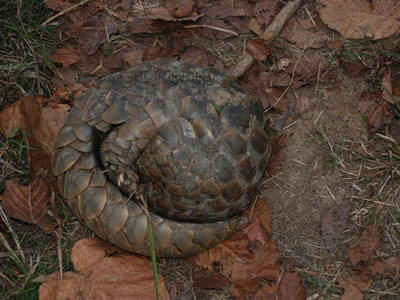 The Indian Pangolin (Manis crassicaudata ) is an important mammal among the smaller animals of the park. 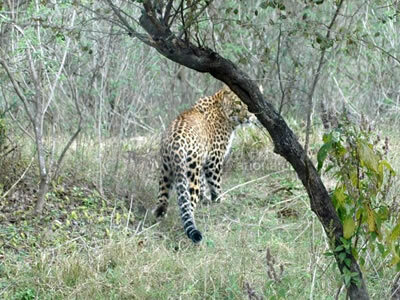 Fire is a major threat to this animal as it kills the animal by burning it and by depriving it of food by destroying termite colonies in the forest. Bats are another important group of mammals that are important constituents of the park’s biodiversity. The Zoological Survey of India has reported nine species of bat from the Park. The reptiles are represented in the Park by a number of snakes including the python (python molurus), King Cobra (Ophiophagus Hannah), Common Krait (Bungarus caeruleus), and Spectacled Cobra (Naja naja). The Indian Monitor Lizard (Varanus bengalensis ) is also common. There are over 315 bird species in the Park. Varieties of waterfowl are found on the Ganges and its perennial tributaries, including ducks, cormorants, egrets, plovers, and herons. A check list of birds in the Park has been given in the Annexure.